One of the biggest challenges that we've found digital marketers face today is how to set and measure the goals for their department. Of course, every company has different goals it hopes to achieve with its marketing. However, for most B2B companies, teams are tasked with lead generation, sales pipeline contribution and revenue generation, or what we like to call pipeline marketing. To help marketers make this leap, we've built a visitor-to-customer revenue template and wrote this blog post to walk you through the important steps of building out your marketing goals. This template will help you work your way up the marketing funnel starting from your end revenue goals all the way to your top of funnel lead generation goals. It will also help you answer the question: how does my company compare to other B2B companies? While assessing this model remember, improving the effectiveness of your funnel will also help to improve other important SaaS metrics like customer acquisition cost (CAC) and pay-back period. The first step of your model is to determine how much revenue your marketing and sales teams need to generate for the 2015 fiscal year. The second step in your model is to determine the percentage of this revenue that will come from your digital marketing efforts—with prospects passing through your website—and move through your inbound lead marketing-to-sales handoff process. If you're not sure where to start, Insight Venture Partners' benchmarks suggest that marketing sources 41 percent of a B2B company's pipeline. Although, we've seen this number vary substantially based on the current structure and goals of each company. The third step in your marketing goals' development is to determine the average revenue generated per customer. Knowing the annual value of your customers is pivotal in evaluating your overall pipeline, as it reflects both the payback period and the customer lifetime value when analyzed in conjunction with customer acquisition cost. This will yield the number of new customers that need to be won to meet your revenue goals. Now it's time to enter your current funnel conversion rate metrics. Start by entering your opportunity-to-customer close rate. If you don't know these numbers off hand, we've included some B2B benchmarks in the template itself that you can use as an estimate. At this stage, we've also included a column you can use to input your goals if you aren't achieving the desired conversion rates at any stage of the funnel, so you can clearly see the impact of increases in performance at any particular stage. Repeat step 4, but this time enter your SQL-to-opportunity rate. Enter your lead-to-MQL conversion rate. 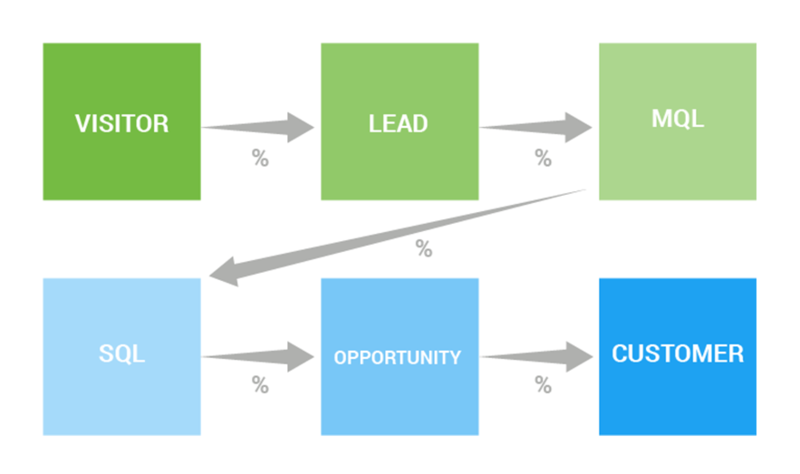 Enter your website-visitor-to-lead conversion rate. Again, if you don't know your website conversion rate off hand, we've included B2B marketing benchmarks by industry from across HubSpot's entire client base that you can use as an estimate. Enter your actual annual website visitors. Not too hard, right? Download our marketing goals calculator, and see how your inbound marketing efforts can help your company hit its growth goals. Once you've completed this task, you can also use our service-level agreement template to dive into your buyer personas, marketing channels and lead value to get better look at just how you're going to acheive these goals. We believe that every good salesperson (or any person at all) always has room to grow in their role and improve their skills. Matthew Buckley is a former New Breeder.